Sold by Peacockbooks (4.5 out of 5 stars | 858 ratings). Pay for your order in equal monthly installments (EMI), using any one of the payment options in the table below. Your bank will convert the payment done using credit or debit cards into EMI in 3-4 working days. For payments done using credit and debit cards, to make this a No Cost EMI offer, the interest amount will be discounted from the price of your order. Your card will be charged for the item price minus the discounted interest. The total amount you will pay to the bank (excluding GST) will be equal to the price of the item. The bank will charge GST on the interest amount. For payments done using Amazon Pay EMI, the price will not be discounted upfront. Instead, you will not be charged any interest for a No Cost EMI offer. About *NoCost: For payments done using credit and debit cards, the bank will continue to charge interest on EMI as per existing rates. However, the interest to be charged by the bank will be passed on to you as an upfront discount. Total Cost shown above does not include shipping charges. EMI providers may charge you pre-closure or other charges when you cancel/return an EMI order. This volume is a comprehensive textbook for the undergraduate course in sports nutrition. Focusing on exercise physiology, this text is to be used in a certification course sponsored by the International Society of Sports Nutrition (ISSN). Millions of consumers want to lose body fat, gain muscle mass, and/or improve exercise performance. In addition to an exercise program, they often look to sports supplements as ‘tools’ to help them reach their goals. This book, the culmination of years of work by the thought leaders in the sports nutrition field will help the consumer, student, scientist, and sports nutrition professional sift through the huge volume of information and come up with reasonable and scientifically-based ideas and conclusions about sports nutrition. But the book covers much more than the short list above. Whether you are a student, scientist or sports nutrition professional, this book will serve as the resource for you in this rapidly growing field. To get the free app, enter mobile phone number. I ordered this book last summer and then it got set aside while I was focusing on other reading. I just opened it up to start today and realized that the CD containing "extra materials" wasn't included. Very disappointed in not having the full item as advertised. Totally a copied book and NO CD, scam scam scam! All photos in black and white....disappointed for $ spent on this text book. 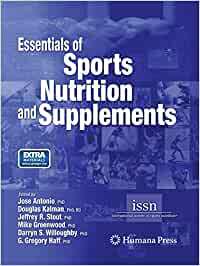 This is a comprehensive textbook of sports nutrition and supplementation written by a lot of big names in the sports nutrition field like Antonio and Stout, along with other leading exercise physiologists and nutritionists.The authors challenge a lot of the current nutritional recommendations made by mainstream RD's and nutritionists. It should definetly be kept for reference by trainers, nutritionists, and exercise science and nutrition students. Enjoyed the information and found it useful. Illustrations is a bit disappointing and print is difficult to read. Supplement information is very useful and up to date!